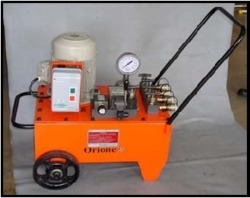 Leading Wholesale Trader of power packs pumps from Faridabad. Our organization is among the leading names in the industry for distributing and trading Power Packs Pumps. The offered power packs are made from high-grade materials for serving a long period of time. These power packs are durable, resistant to abrasion and are ideal for lifting jacks in automobile and heavy engineering industries. These are available at cost-effective prices as well. Looking for Power Packs Pumps ?